Last week we moved on (not very quickly) in our study of Great Britain and the United Kingdom. I'm personally a little overwhelmed with just how much we could really do if we really wanted too. :) That said, we focused more on the flag this week and had fun watching some different videos on YouTube and learning about the British currency. Thanks so a friend of ours, we were able to see first hand what counterfeit currency looks like (she wasn't passing it off, but unfortunately was on the receiving end of it!). McKenna started her first official chapter book this week (Christmas at Camelot) and Laurianna is reading through the Fairy Tales book still and together we're reading Knight at Dawn to prepare for our studies on knights and castles in a few weeks. DLTK - British Bobby craft and Palace Guard craft - too cute!! I have been following your blog for a few weeks now in preparation for starting Galloping The Globe soon. I had to comment on your flags worksheet!!! 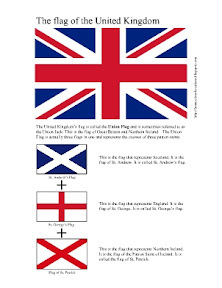 I live in the UK (with the USAF)and see the flags all the time and never put together how the Union Jack was a mix of the three country flags! I am so excited to get the chance to share this with my boys! Thank you for your hard work and inspiration!